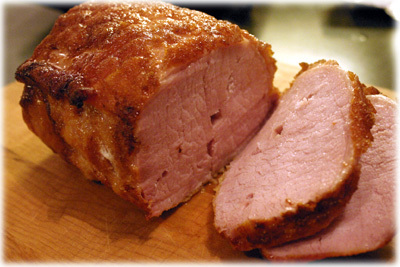 Peameal bacon, also called cornmeal bacon, seems to be most common in Canada and could very likely have originated here. In the US it's often referred to as Back Bacon or Canadian Bacon but it's the same thing. 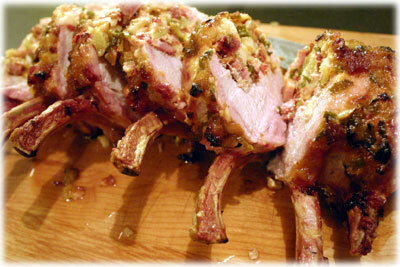 Made from a boneless pork loin it's slowly sweet pickle-cured and then rolled in a golden yellow cornmeal coating. Most often you'd buy peameal bacon already sliced and you just fry it for breakfast. 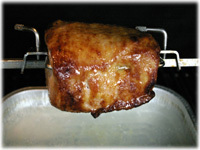 Sometimes you'll see a whole 3 or 4 lb peameal roast for sale in the supermarket, that's what you want for this rotisserie recipe. After cooking the roast it's sliced and can be served as is or on buns with lettuce, mayo and tomato. This recipe was so simple I hesitated even putting it on the site, but it's worth it just for the taste alone. Insert the rotisserie skewer through the center of the peameal roast and center on the rod so it's balanced and will turn on the grill evenly. Preheat the grill to 375F - 400F. Place the peameal roast and skewer into the rotisserie unit. 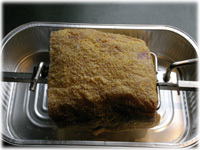 Place an empty disposable aluminum pan under the roast. 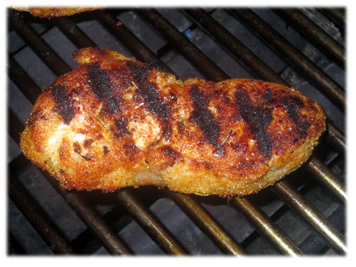 Turn on the rotisserie to ensure it spins freely and then close the grill lid. 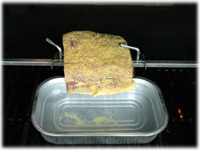 Let the roast spin and cook, the exterior will develop a really nice crispy coating. After about 45 minutes check the internal temperature, if it's at least 145F then it's good to come off the grill. 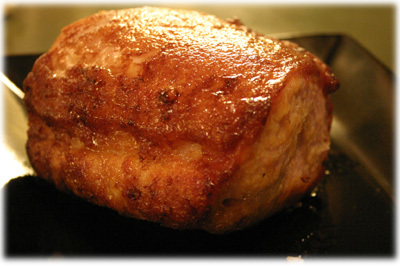 Cover the peameal roast with aluminum foil and let rest for 10 minutes.